How to Make the Perfect Puff Pastry! Everything You Need to Know. While it may seem easier to grab frozen puff pastry from the stores. But have you ever thought of making your own pastry from scratch? Yes, it's possible! There is something special about puff pastry—the flaky layers, laden with butter flavor may seem like the kind of thing you leave to the experts. However, nothing could be further from the truth. Is puff pastry dairy free? How do I make puff pastry? Can I make puff pastry without butter? Can you buy puff pastry? What is the difference between puff pastry and phyllo dough? What is a puff pastry sheet? Can I use puff pastry instead of filo? Are crescent rolls the same as puff pastry? How do you make puff pastry in the oven? What ingredients are in puff pastry? What is the difference between puff pastry and flaky pastry? Can I leave pastry in the fridge overnight? How do you make flaky pastry dough? You can do it yourself in the comfort of your home, easily. And the best thing is that you get fresh puff pastry that tastes better than anything you can get from the store. But how do you go about it? When it comes to actually making puff pastry at home, you have a few options. Frankly, these options vary by complexity and time you're willing to invest. The more time and effort that you put into the pastry, the more flaky the pastry will be. This is why we are going to provide you with two different options here. Full recipe here with detailed instructions. The video below walks you step-by-step on how to make this puffy pastry recipe. Most puff pastry recipes do not include heavy cream, so this is a unique version of puffy pastry from Martha Stewart. Heavy cream makes a recipe rich and worthy of experimentation. The type of flour used in this recipe is important. As you will learn, all-purpose flour has less gluten in it. Gluten is a binder and we want this to be flaky, so less gluten is a good thing here. When picking the butter for this recipe, it is best to use a higher fat content butter such as Kerrygold. This will make for a richer, flakier dough. Full recipe here with detailed instructions. The video below, walks you step-by-step on how to make this puffy pastry recipe. his recipe is a fast recipe. You can make this puffy pastry in about 15 minutes. This will not turn out to be quite as flaky as the first recipe but it will still be darn good. Your family will still be thrilled. In this recipe you don't need a special european butter. The better quality the butter, the more tasty your recipe will be. However, don't let the type of butter hold you up from creating this pastry. The lemon juice will keep the pastry from turning grey in the fridge. A greyish tone to your pastry doesn't mean that anything is wrong with it. Instead the lemon juice helps the pastry keep a more natural tone to it. It is critical that your dough remains cold. If at any point while you are working with your dough and it starts to become soft and/or warm, stop and put it in the fridge for half an hour. It is critical that your dough stays cold. Vegan has a history in a plant-based diet and animal rights. The term can mean different things depending on why people choose to avoid animal products. Puff pastry with animal products, and in most cases, butter, is quite common. However, that does not mean that you cannot find puff pastry that is strictly vegan. Avoid anything that includes animal products such as butter and milk. Check the ingredients and determine whether it is vegan. There are various recipes that you can use to make puff pastry vegan. However, it may be easier for you to purchase it at the store. A good example is the shortcrust puff pastry. The shortcrust puff pastry is excellent for making savory pies and homemade pop tarts. This type of puff pastry is easy to make, but as always, it is more convenient to buy it, and include it in a recipe. You can as well choose to make your vegan puff pastry by using a substitute for butter. But how do you not use butter and still get a perfect puff pastry? Well, the secret ingredient to making puff pastry without butter is using miso paste and cocoa butter. The Japanese seasoning, miso paste, adds a special kick of butter flavor into the puff pastry. You may not notice any difference between the puff pastry that includes butter and puff pastry that uses miso paste or cocoa butter, instead. Typically, puff pastry is not gluten-free. Most of it is made from wheat flour, and wheat is one of the best sources of gluten. But what is gluten? Gluten is a blend of two proteins in cereals responsible for making the flour, elastic — some people allergic to gluten and consuming it causes an immune response. For example, people suffering from such conditions as celiac can have an adverse reaction if they consume foods that contain gluten. A gluten-free diet does not contain rye, oat, wheat, or barley. But how do you get a gluten-free pastry? It sounds quite tricky to find pastry that does not contain gluten. However, it is not impossible. There are various gluten-free puff pastry products on the market. But the main question is what is in the puff pastry that does not contain wheat flour? 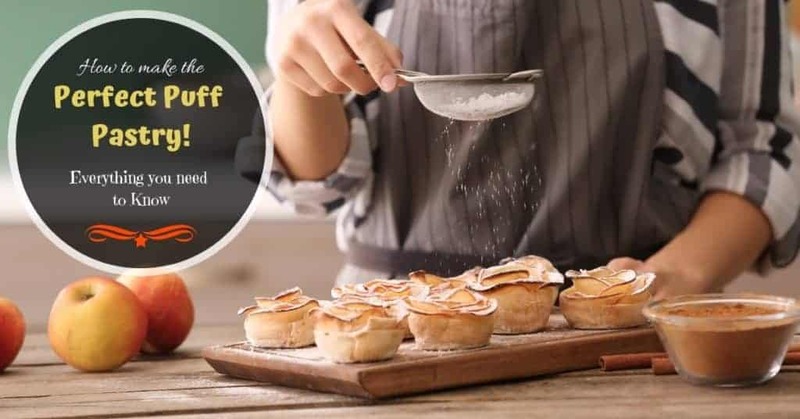 In its place, you can use maize flour or even rice flour to make delicious gluten-free puff pastry. Also, this may be the main ingredients in gluten-free puff pastry that you buy from the store. Some people maintain a dairy-free or vegan diet by avoiding certain food products for health or ethical reasons. Whatever the reason, it may seem like puff pastry is not the best food for vegans. But nothing could be further from the truth, it just takes a bit of research, or find the right recipe to make it yourself. You will still find dairy-free puff pastry from the stores and use it in a variety of recipes. Just go through the ingredients, and determine whether the puff pastry contains butter or not. We discovered Genius brand gluten- and dairy-free puff pastry here. But what does a dairy-free puff pastry entail? The most common ingredient in puff pastry is butter, and of course, and wheat flour. A dairy free puff pastry does not contain any butter, which is a byproduct of milk. There are other alternatives to using butter in homemade pastries, and it includes olive oil or margarine. What gives puff pastry its striking appearance is airy rise between layers of pastry. The pastry can rise several times its original size, and that's how you know you have got a perfect puff pastry. However, to create several layers, the baking must be flawless. The laborious process of folding and rolling has a significant role to play in the development of that perfect puff. Typically, you should chill the dough until it is almost stiff. Alternatively, you can use cold water or chilled butter. In most cases, it depends on preference and the results that you want. You must then roll the dough with a fat slab of butter at the core. Press into thin sheets and fold several times. The butter creates insulation between the layers. The heat produced during baking creates steam and the oil in the butter between the layers causes separation and lift. Errors during the rolling process will also cause separation and lift problems. Don't let the butter be too soft. Ideally, it should be the same temperature with the dough. When rolling, move the pin from the center towards the edge. Don’t go past the edge as this may cause the layers to compress and not rise well. Also, resist the temptation of pressing down too hard and make sure the corners are squared neatly. There should never be overhanging layers. The final hurdle is the thickness. Ideally, it should be about 1/3 or 1/4 of an inch if it is to rise correctly. You must also bake it in an oven that is around 400 degrees to create sufficient steam that causes the rise. Yes, it is easy to make puff pastry without butter. The most common products that can replace butter include the miso paste. 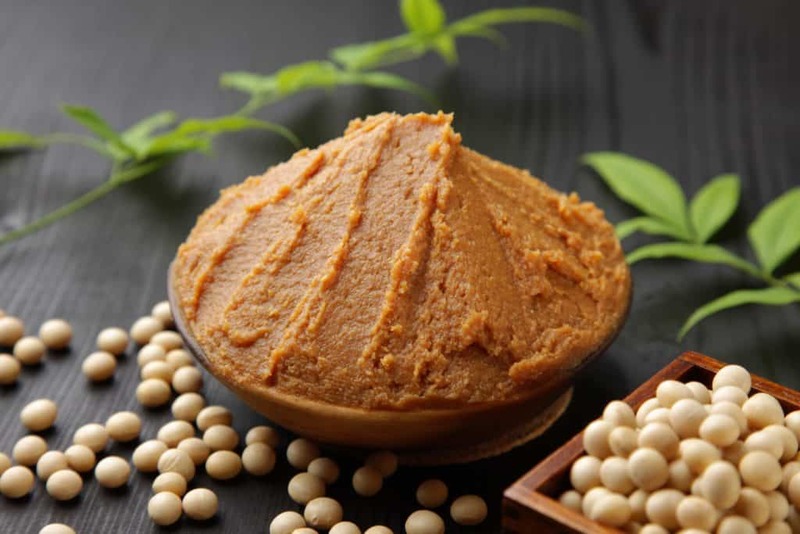 Typically, the miso paste is a Japanese seasoning that almost tastes like butter. Any ardent food enthusiast may not notice the difference between puff pastry that uses butter and the one that utilizes miso paste. You can, as well, use cocoa butter in the place of butter. Cocoa butter is a good option, especially for a vegan recipe. It is soft and stable to make homemade puff pastry. Cocoa butter helps the dough maintain its shape and become flexible. The other option for a delicious and healthier puff pastry is using oil in the place of butter. You can go about it by adding olive oil into a mixture of the sifted flour and salt. Mix it gently and leave it to set for a few minutes. The oil will make the dough soft and flexible, just like you want to for the best puff pastry. You can then add cold water and knead using your hands until all the ingredients mix perfectly. Form it into a ball and then cover it with a plastic wrap. Finally, refrigerate for about 30 minutes. Yes, you can buy puff pastry from your local store. And while you can make your own puff pastry; it may be easier to buy it from the store. Mostly, the dough is rolled out and pressed into thin sheets. The sheets are then rolled together with alternating layers of butter. 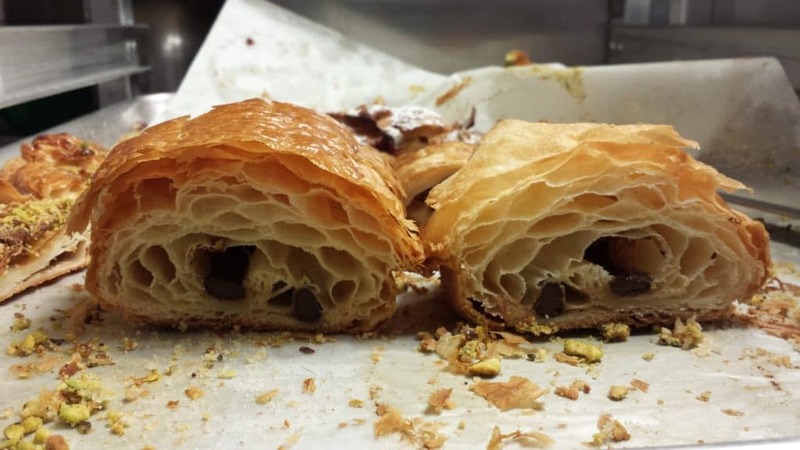 Typically, the folks at the puff pastry factory make better products because they use machines. They can roll and shape the sheets of dough perfectly and attractively that you may not be able to achieve with your homemade pastry. Among the benefits of buying your own puff pastry include saving time. For some people, preparing the dough, allowing it to set, and cutting it into rectangles and rolling the sheets together can seem like hard work. After all, you still have other recipes and dishes to prepare. Factory prepared puff pastry may be ideal for a variety of delicious and savory applications. You already know what you need before you head out to shop for the puff pastry. Therefore, chances of getting the right one, for the dish you are planning to cook, are high. However, if you need a perfect puff pastry, with the ideal puff, then you may consider making it on your own. Homemade puff pastry is fresher and can sometimes be more delicious than the puff pastry that you buy from the store. Puff pastry and phyllo dough are two amazing inventions. Typically, the two foods are at the core of various recipes. They are both flaky and delicious. But what is the difference between puff pastry and phyllo dough? The main difference between the two is in the thickness and preparation process. Phyllo dough is much thinner and uses a small amount of fat, and is common in Greek markets. You should defrost phyllo dough in the refrigerator since it can quickly become sticky. The phyllo dough sheets are usually brushed with oil or fat before layering them together. You should always keep phyllo dough from drying out by using a damp towel or plastic covers. Don't refreeze it as this can cause the phyllo dough to be brittle. Unlike phyllo dough, puff pastry uses butter and is folded multiple times using layers of dough and butter. The purpose of the butter between the layers is to create insulation and separation when rising. The most delicious puff pastry is which uses butter as opposed to oil or any other substitute for butter. Make sure that you are buying puff pastry that contains butter. When working with puff pastry, defrost in the refrigerator and work quickly and gently to prevent compressing the layers. Phyllo dough is perfect for a variety of Greek dishes such as spanakopita. You can also use it to make appetizer cups. The savory applications that you can use puff pastry include croissants, tarts, and pastry pockets. You cannot use phyllo dough and puff pastry interchangeably. There are significant differences in the thickness, preparation process, and the ingredients. And as such, each of them is perfect for specific recipes. You purchase puff pastry sheets from their stores, ready to bake and puff into layers. Puff pastry sheets are usually pre-rolled or folded. They are perfect for both beginners and experienced chefs to use in a variety of recipes. The common ingredients in most commercial puff pastry sheets include vegetable oils, wheat, salt, alcohol, yeast, and fat. 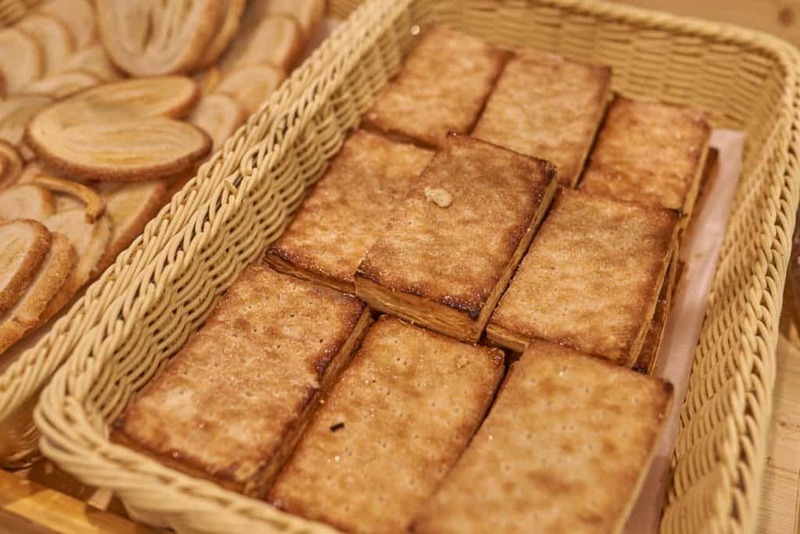 Typically, the puff pastry sheets may not contain dairy products and therefore suitable for vegetarians. However, you will need to check the ingredients and enquire to be sure. There is a wide variety of puff pastry sheets on the market, and they all do not use the same ingredients. Therefore, you may need to exercise due diligence when purchasing. They have a superior texture and flavor, and most of them do not need any pressing with the pin. You use them directly in your recipe. Some of them even come with a baking paper, and all you need is to pop them in the oven. Ideally, refrigerate on the day of purchase and defrost overnight before you can use the pastry sheets on various applications. The storage type for puff pastry sheets is, chilled. Puff pastry sheets can create new desserts, appetizers, and entrees. Apart from the fact that puff pastry and phyllo come from different places in Europe, they are entirely different. Of course, the two are a versatile dough that you can use in a variety of applications, for savory and sweet recipes. And while they may both be multi-layered, they are far from being interchangeable. Even from their appearance, you will notice that puff pastry is much thicker than Philo and cannot be perfect substitutes for each other. In native Greek, phyllo means leaf. 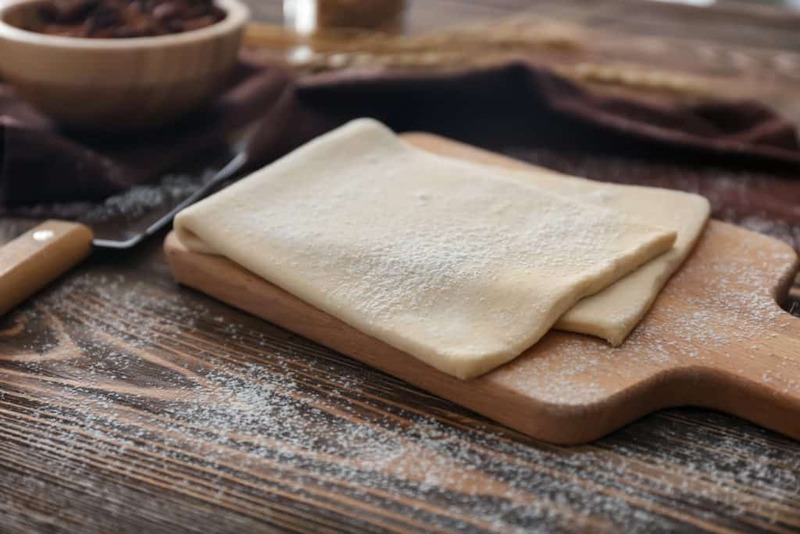 Phyllo dough is unleavened and stacked into several sheets with melted butter or oil smeared in between, before baking. The preparation process for phyllo dough is quite arduous, and most people prefer to buy it from the stores. The most famous application for phyllo dough is making baklava. However, you can use it to wrap around fillings and press into cups. On the other hand, puff pastry uses a significant amount of butter and is folded and refolded several times to achieve the ideal results. The moisture in the dough is what makes puff pastry to rise and expand many times its original size. 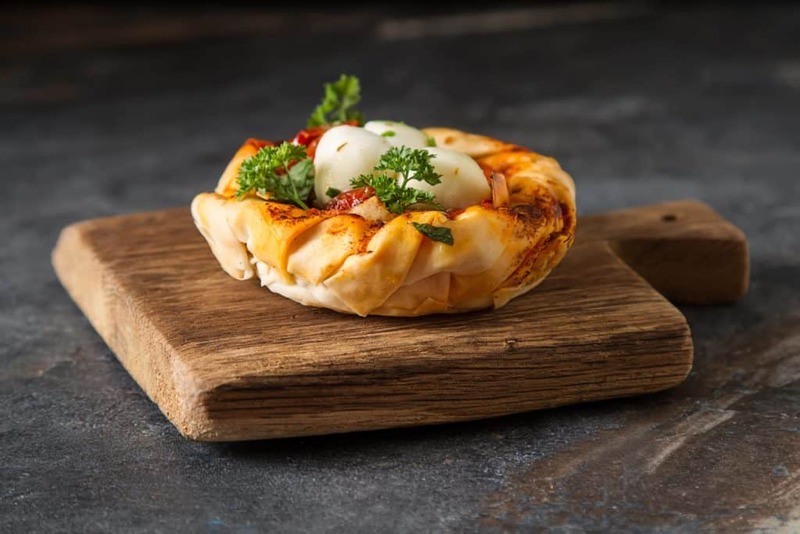 Mainly, you cannot use phyllo dough puff pastry interchangeably because they use different ingredients and the preparation process is entirely different. This variance produces different flavors which may only be applicable on particular recipes. For example, using puff pastry in place of filo dough to make baklava will produce completely different results. There are cases where they both can play similar roles. For example, you can press them into cups for muffins and cover with savory and sweet fillings. Both puff pastry and crescent rolls have a characteristic crisp and high finish. They have visible golden brown layers of dough. Crescent rolls and puff pastry both use the same ingredients. The softened or melted butter that is applied on the flat circle or the dough is responsible for the rich taste that crescent rolls have. The wedges are then cut and rolled into a crescent shape. However, the amount of butter used in making croissants is smaller than that what you use in making puff pastry. Therefore, crescent rolls are not as rich as puff pastry. Also, the number of turns between the two is different. Crescent rolls have fewer folds. As a result, crescent rolls do not rise as much as puff pastry does. Some croissant recipes may use an egg wash, and others only use melted butter. In contrast, puff pastry uses frozen butter as opposed to melted or softened butter. Another difference between the two is that puff pastry does not contain baking powder or yeast. It rises only through the interaction of water, dough, and layers of butter. The mechanics involved are not hard to master but making puff pastry the traditional way may be arduous. What you use to cook puff pastry determines how much puff you get. 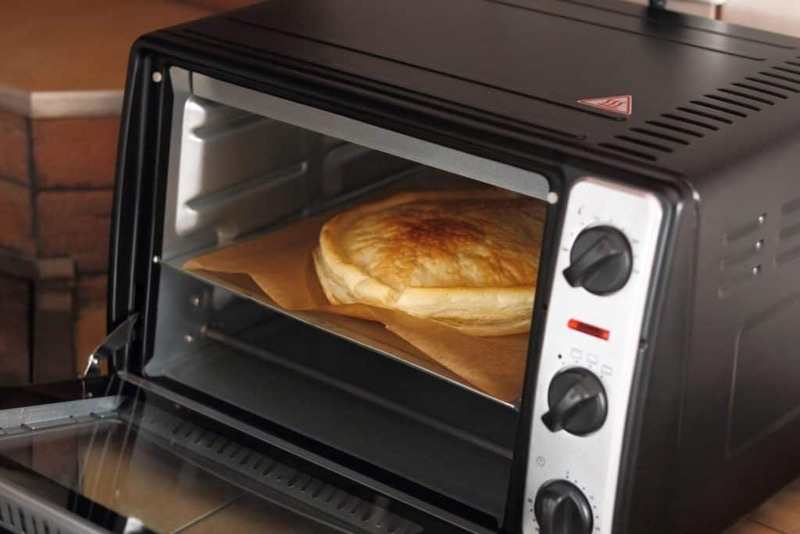 A toaster oven or microwave will not produce the same golden puff effect that you get from the conventional oven. Therefore, always choose the conventional oven if you want perfect results from the puff pastry. Before you can bake, preheat the oven for about 20 minutes. The puff pastry depends on the oven heat to cook and rise. Place the different puff pastries about an inch apart. 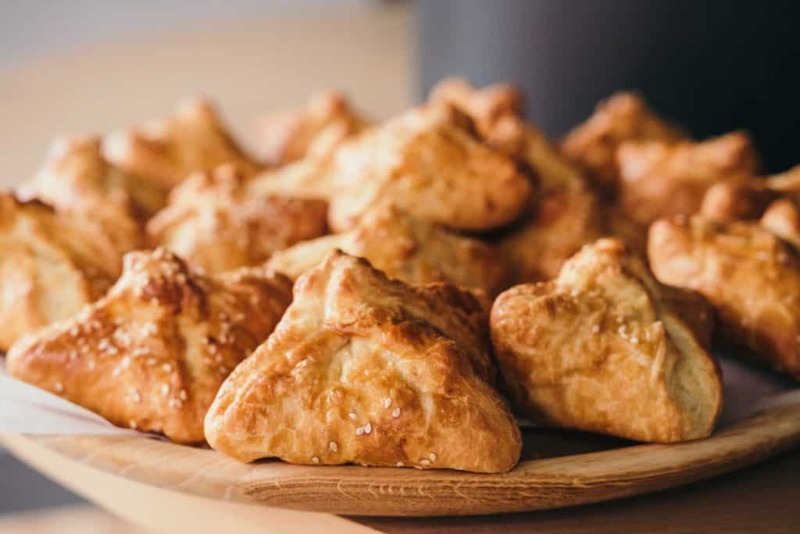 If your goal is the crispy and flaky puff pastries, then use a fork to poke holes on the unbaked pieces to allow moisture and air to escape, when exposed to heat. And if you want it to be flatter, poke more holes, and it will look something like Napoleon. Make sure the puff pastry fillings are at room temperature. If they are warmer, they may melt the butter, and the final result may not be what you want. Apart from the oven heat, the type of baking pan you are using can affect the baking time. Ideally, use a dark, nonstick baking sheet to quicken the cooking process. When it is done, the puff pastry should be golden and of course, puffy. Not doughy and wet. The main ingredient in puff pastry is, of course, flour, wheat flour. However, some people may be allergic to gluten. In such a case, you can opt for other substitutes for wheat flour, such as rice flour. Gluten in the wheat flour is responsible for the natural rising of the puff pastry. In the absence of gluten, you may need to use baking powder. Butter, and lots of it, is another critical ingredient in puff pastry. It creates insulation between layers of wheat and prevents compaction. 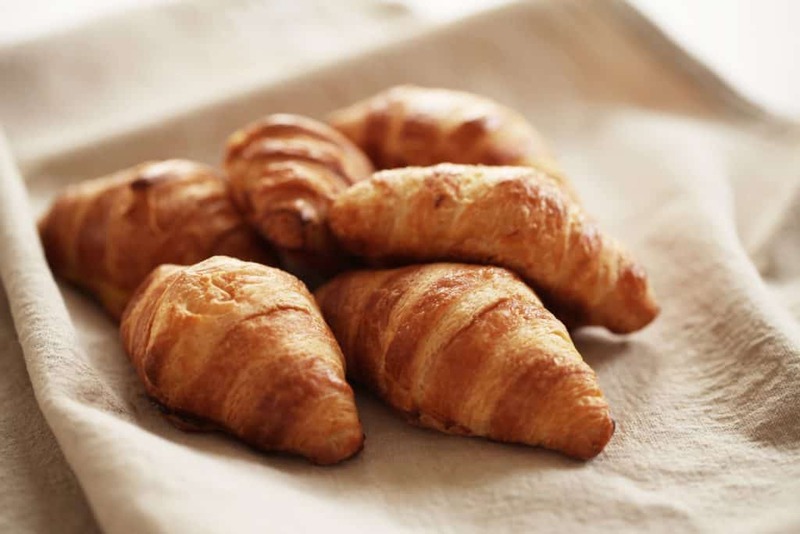 Butter is also responsible for the flakiness in croissants and puff pastry. Butter also has a pleasant flavor and helps in the distribution of natural flavor in the puff pastry. In vegan diets, you can use oil such as olive oil or vegetable oil instead of butter. You can as well use margarine or lard. This may depend on your preference. Other suggestions include miso paste and cocoa butter. They may not completely replace butter, but they are good options. You will also need some pure sea salt for seasoning. The amount of salt that you need depends on how much dough you are preparing. For example, 8 ounces of wheat flour will only need a pinch of salt. You will also need some cold water. Both puff pastry and flaky pastry use the same ingredients. However, the preparation process is what differs. Puff pastry involves an elaborate process of dough-folding and employs more fat, preferably butter. The folding and butter are what creates the numerous layers. Shortcrust pastry does not need to puff, and the preparation process is quite versatile. 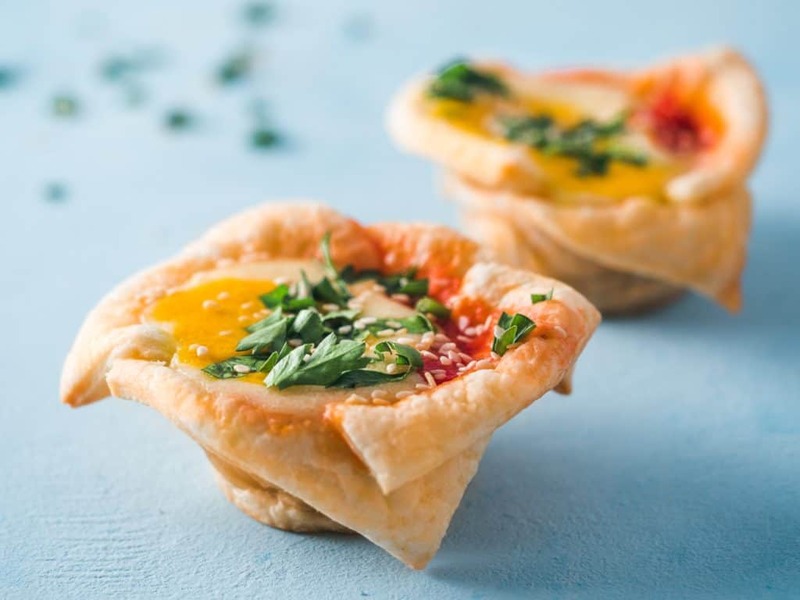 Many recipes for shortcrust pastry call for more water, but you can substitute with eggs. The rolling and folding of flaky pastry are similar to puff pastry, but with fewer folds. Making flaky pastry is easier than making puff pastry. Flaky pastry utilizes a blend of dough and large lumps of shortening. It is this shortening that keeps the Rolled particles apart, producing a different texture from the puff pastry. Puff pastry expands dramatically after heating. Flaky pastry does not behave the same way. Some of the applications of flaky pastry include sausage rolls, plaists, and pasties. Leaving pastry in the fridge allows the gluten in the dough to relax. As a result, you have a more tender pastry that is unlikely to shrink. It also gives the dough some time to absorb water to have minimal or no dry spots. You can freeze the dough for up to 3 months as long as you thaw it sufficiently before preparation. Baked pastries should be kept in airtight containers or wrapped tightly in cling film before refrigeration. The container or cling film will prevent the formation of dry skin on the pastry. This way, it can go for up to six weeks. To avoid cracking, allow the pastry to sit for about 30 minutes out of the fridge before you start rolling. Handle the dough as little as possible to prevent tearing and undesirable stretching. You can leave the yeasted dough in the fridge overnight to slow down the rising process. Some people prefer doing this as it gives the pastry some characteristic flavor and feel. Always use a sharp knife to cut the edges. Preheat the oven before you start the baking process. Baked pastries are more delicious the same day that you make them. To make flaky pastry dough, you will need about 9 ounces of sifted wheat flour. In a large bowl, mix this floor with 10 ounces of unsalted butter and a half teaspoon of salt. Use a round-bladed knife to cut the butter into the flour. Make sure that the mixture is crumbly and the butter is about the size of a bean. Add 120 ml of ice-cold water into the mixture. Continue the mixing process in the bowl until it all comes together. Transfer the dough to a floured work surface and shape it to a square. Using a French pin, roll the dough into a rectangle and then fold the bottom third to the center. Fold the top third also, to the center. Turn it 90 degrees and fold again. Wrap the pastry in cling film and allow it to rest for 30 minutes. Repeat the rolling and folding process for between 2 to 3 times and the rectangle will get neater. After the last fold, cover the pastry with a cling film and refrigerate for about 1 hour or overnight before using. You can refrigerate for up to 1 month.